The knights of St. John,or the Hospitallers, have an amazing and rich history of being Defenders of Christendom. It was only a short time after the Knights of St John had established themselves at Rhodes when they discovered there was a fantastic creature sharing the island with them. Several eye-witnesses described it as a dragon, and before dismissing the possibility outright, perhaps we should at least consider what the eye-witnesses reported. As incredible as it may seem, who is there that can say with certainty that such creatures didn’t exist, and don’t continue to exist in places unknown to man even in our own time? How often are we ourselves unaware of the serpent gliding unseen through the tall grass, or coiled tightly in a darkened corner of our own home? Is it really too much to believe that in those days a nameless monster still stalked the barren fields; a fiend of darkness that appeared in the depths of night to seek its prey, rending and devouring at will? If the existence of the monster could be proven by its effects, the foul presence of the creature was real enough to the people of Rhodes, for whenever it appeared it would leave behind a gruesome path of destruction as it went about feeding on whatever victims it chanced to find. Its hidden lair was thought to be in a deep pit at the foot of Mount St. Stephen, for animals that strayed into the region for water often turned up missing, sometimes including their shepherds. Even pilgrims to the Chapel of St. Stephen, located high on the mount, frequently disappeared without arriving at their destination. 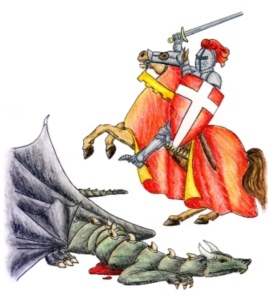 In a gallant effort to rid the island of the creature, one valiant knight of St John after another rode out to slay the dragon, though each only died in the attempt. It seemed there was no way for them to succeed, for the scales covering the dragon were said to be completely uniform and harder than steel, invulnerable to the arrows, spears and swords of a knight. Finally, after the loss of many good knights, the Grand Master, Helion de Villeneuve, forbade any of his knights from risking their lives in a futile attempt to kill the dragon. Whatever the fearsome creature was, it seemed beyond a knight’s power to subdue. A young Knight of St John by the name of Dieudonne de Gozon, knew the entire truth of the existence of the dragon. Once he himself had ridden out against it, though upon facing the horror of the serpent-eyed monster he had become frozen with fear and turned away from the quest. Returning to the priory with his life but without his honor, Gozon soon found that it was impossible to live with his shame. Taking his leave from his brethren at Rhodes, Gozon returned to his father’s castle, haunted by his failure and the image of the dragon that would often invade his dreams, giving him no peace. Gozon knew he would have no rest until he had faced his fears and redeemed his honor, and only the death of the monster could blot out the offense against chivalry. The knight was well aware of Grand Master Villenueve’s prohibition against fighting the dragon, but he was even more aware of his need to redeem himself in his own eyes. In returning to challenge the dragon, Gozon at least had the advantage of having actually seen the horrible monster. With its sharp fangs and lashing tail, it was unlike anything Gozon had ever encountered before. The young knight’s warhorse had also reacted instinctively at the time, fighting the reins as he seemed to stagger from the creature’s foul stench, effectively repulsed from the dragon’s very presence. If not for Gozon’s excellent horsemanship, he would not have been able to remain in the saddle. In the days that followed Gozon found himself constructing a detailed likeness of the dragon. Fashioned from common materials, the knight worked steadily, closely following the image of the winged serpent in his mind’s eye. Although nothing more than a statue when it was finished, he had managed to capture the dragon’s fearsome aspect. Appearing immensely powerful, with talons and fangs several inches long, Gozon’s warhorse shied away even from this image of the monster. If the dragon had any weakness at all, it would be to its underside, for Gozon had seen enough to know that the overlapping scales did not protect it there. The problem, of course, would be getting past the snapping jaws and swiping tail of the monster, either of which could kill in an instant. A possible solution came to mind, and soon Gozon was scouring the countryside for a suitable pair of hounds. Returning home with two huge mastiffs, the knight was satisfied that he had found the solution to the dilemma. 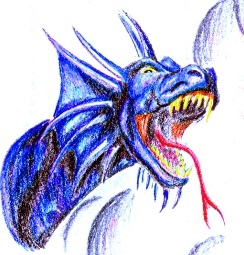 Gozon filled the hollow underside of the “dragon” with food, thus training the aggressive mastiffs to run under the creature to obtain the reward. At the same time, the knight set his lance and charged his warhorse directly at the monstrous statue, doing so again and again until he felt confident his mount would charge the real dragon. When everything was finally prepared, Gozon sailed back to Rhodes, landing with his squires on a remote shore of the island where they would not be observed. Making their way in secret, the group eventually arrived undetected at the Chapel of St. Stephen. Commending himself to God, and praying that he was ready for what he was about to do, Gozon mounted his warhorse and released the mastiffs. Galloping easily down the slope in pursuit of his huge dogs, the young knight felt his heart leap as the dragon burst from the tree line. Fierce and terrible to behold, its eyes fixed on Gozon. The mastiffs growled and bounded toward the monster, momentarily distracting the enormous reptile as Gozon set his lance and raced across the open field toward his objective, praying for the opening he sought. Gozon was charging at full speed as he approached the dragon, though the creature had turned away to confront the dogs’ vicious attack. Rather than charge a second time, Gozon drove at what he believed must be a vital area, thinking that the scales could not resist the point of a lance driven by the weight of his heavy warhorse. The lance struck, shattering into dozens of splinters at the moment of impact, seeming to do no real injury to the dragon. Howling with rage, the creature wheeled on Gozon, and straightaway the terror-stricken horse bolted and bucked in fear. The agile knight was forced to dismount, leaping from the saddle lest he be cast to the ground in a heap. Standing now before the onrushing dragon, Gozon drew his sword, hoping only to strike a blow before he died. The mastiffs had not left their master, however, and seemed to have no fear of the thundering dragon. Pouncing and biting, they deftly avoided its tooth-filled maw, again furnishing a valuable distraction to aid their master. Seizing the opportunity, the knight swiftly moved in. Striking at the monsters neck with all his might, Gozon’s sword rang as the blow was deflected by the overlapping scales. Ducking and rolling to one side to avoid a swipe of a massive claw, Gozon knew his efforts were useless unless he could somehow reach and pierce a vulnerable spot. Suddenly the dragon’s tail whipped around without warning and struck Gozon full in the body, sending him flying as the dragon turned quickly upon him. He lay stunned by the blow, though he had not completely lost consciousness. As the monster reared up over him, Gozon found he still held his sword clenched in his right hand. Gozon stood unsteadily, nearly overwhelmed by the stench of the dragon, bent beneath the creature as it bellowed in triumph with a deafening roar. Shaking his head to clear his muddled wits, Gozon observed blood running freely from fresh wounds on the monster’s belly where the mastiff’s fangs had torn its flesh. Now was his chance! With all his remaining strength, Gozon thrust his sword into the wounds, noting with grim satisfaction that the blade bit deeply into the soft underbelly. The dragon thrashed and kicked, sweeping him off his feet, though the struggling knight refused to release the weapon which impaled the monster. Twisting and turning the blade, Gozon hung on as the beast finally stilled and fell forward, shuddering as it died. When there had been no sound of either Gozon or the dragon for some time, the squires ventured to wander down the hillside to the scene of battle. There they found their master sprawled on his back, trapped beneath the slain dragon. Gozon lay still, his face pale and lifeless as the squires pulled him from under the dragon. Removing his helmet, the squires splashed cold water upon Gozon’s face, laughing with relief as they witnessed him sputter and look about. Sitting up, Gozon saw that he had indeed slain the dragon. One might think that the battle was over with the death of the awful monster, but such was not the case. After he had rested sufficiently, Gozon retrieved his mount while his squires cut off the dragon’s head. Then, making for the city of Rhodes, a growing crowd of peasants joined them along the way, joyously celebrating at the news of the dragon’s death. Lauding their champion, they escorted Gozon in triumph to the palace of the Grand Master. Gozon approached the palace as word of what had transpired filled the city. It chanced that the Grand Master was present, and in a few moments Gozon stood in the Great Hall before the head of his order, his armor gashed and dented beneath his torn mantle. His brothers in the Order stood solemnly about their Grand Master, strangely silent in the midst of the general uproar and festivity. Both Grand Master Villenueve and his knight Gozon seemed oblivious to the crowd straining for places around them as Villenueve ordered him to give an account of his exploits. A hushed silence fell as Gozon began to explain his sudden reappearance, recounting the details of his marvelous victory. Grand Master Villenueve nodded from time to time as he listened to the young knight, though he did not seem overly impressed. As soon as Gozon concluded his factual narration, however, the people of Rhodes raised their voices, boisterously acclaiming their gallant patron, praising him repeatedly for his incredible accomplishment. The Grand Master waited patiently for the crowd to quiet. He then stood and commenced speaking by readily admitting that valor was an indispensable virtue for a knight. He sincerely congratulated Gozon for his victory over the dragon, but then continued by alleging that by that act of disobedience Gozon had set himself squarely against his Order. The startled crowd quieted to a shocked silence, as if disbelieving their own ears. Some murmured against the aged Grand Master, but Villenueve remained unmoved. 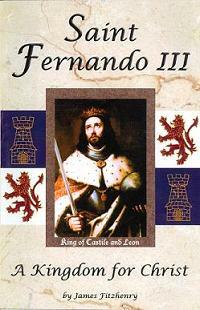 Even if this young knight should have won the acclaim of the entire world, it didn’t make any difference. The rule demanded that Villenueve should denounce Gozon for his disobedience, and he did so. That shouldn’t be taken to mean he disliked the wayward knight, for in reality the Grand Master loved Gozon like a son, and was solicitous for his soul. It was therefore important for him to determine Gozon’s true motivation for his actions, as painful as it might be for him to do so. When the Grand Master turned back to face Gozon, his features had hardened into a mask of anger. He publicly accused Gozon of failing in his first duty, that of obedience to the Master of his order. In combating the dragon, Gozon had inexcusably elevated his own self-will above the dictates of his commander. He might have been victorious over the creature that had held the people of Rhodes in fear, but at what cost to himself? Had not another dragon taken possession of him? The spirit of sedition and disobedience were signs of the ancient dragon, just as were vainglory and the seeking of one’s self-will. Had he not become puffed up by the public acclaim? Was it not true that perhaps the dragon had conquered his heart in turning him against his Master, and thus against Christ Himself? Dieudonne de Gozon bowed his head and made no reply, though Villenueve had enraged the uncomprehending and exasperated crowd, who voiced their disapproval with a great tumult that went up throughout the entire chamber. Gozon could not deny his disobedience, so when Villenueve ordered him to remove his mantle he did so, folding it carefully to place at the feet of the Grand Master. He then turned and walked away, his disbelieving partisans making way as he retreated. Villenueve closely watched the chastised knight as he departed. He could only guess what was going on in the young knight’s heart and soul, but certainly he seemed to be accepting his fate with humility. Gozon had said nothing in his own defense, even with the crowd strongly on his side. He had not become angry or defiant, even when publicly accused. Now he walked away slowly, silently. There was no evidence of injured pride. Good signs, to be sure. The Grand Master’s behavior might seem harsh, but he had not lived to his old age without learning wisdom. He had seen the same pattern often repeated. He knew that frequently the first challenge for a knight was to conquer his own fears. Then, having done so, he would be enabled to conquer his foes. Finally, and most difficult of all, the victorious knight must learn to conquer his pride, in essence conquering himself. Pride was always the greatest danger. Grand Master Villenueve called Gozon’s name, firmly ordering him to return. Gozon stopped, turned with his eyes downcast, and retraced his steps. In a moment he knelt again before the Grand Master, who unexpectedly extended his hand to him. Gozon looked up questioningly as Villenueve closely scrutinized his features. The Grand Master smiled as he observed that there was no resentment, no sullen spirit, no heat of anger in the young knight’s eyes. Gozon took Villenueve’s hand and kissed it, becoming once again a Knight of St. John. The Grand Master then raised Gozon to his feet and embraced his victorious knight, who had just won his second victory of the day, and a much greater one than his earlier victory over the dragon. Through his humility, Gozon had driven a spike though the heart of the ancient dragon. Having proven himself to his Order, Gozon’s transgression was soon forgotten, though none forgot the service he had done for the residents of the island. The chivalrous knight was beloved by the simple people of Rhodes as long as he lived, and he loved them unreservedly in return. 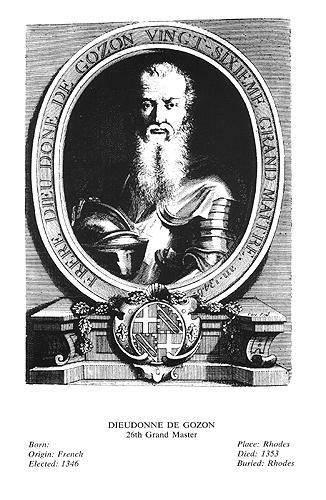 When Grand Master Helion de Villeneuve died, it was Dieudonne de Gozon who was elected to replace him, becoming the 26th Grand Master of the Order. field of battle. read more . . .
life of Rodrigo Diaz, the Cid! after the death of the Cid.